While we believe it is worth the extra cost to feed yourself and your family real, wholesome foods, like organic fresh produce, wild-caught seafood, and grass-fed beef, we know that you may have a budget to stay within on your grocery purchases. Real Plans has some great features and tips to help you stay within that budget while still feeding your family delicious, wholesome meals. We’ve got you covered on this one! One of the best ways to save money on groceries is to plan your meals. Having a plan means that you have a purpose for each item you purchase, and the plan will help you use that item so it won’t sit in your refrigerator and go bad. It also means that you won’t have to make impromptu trips to the grocery store and open yourself up to buying more than you came for. With our Drag-and-Drop Meal Planner, you can drag meals with more expensive ingredients to the trash bin and replace them with more budget-friendly choices. 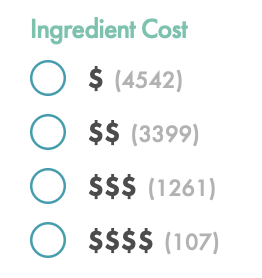 Use the Ingredient Cost filter in the Recipe Box ($). The Recipe Box has many different filters to help you find exactly what you need. On the left-hand side of the Recipe Box, look for the Ingredient Cost filter. Select “$” to find the most budget-friendly recipes in our database. With Real Plans subscribers from so many different parts of the world, market values vary greatly from one place to another. While we do our best to tag them appropriately, it is quite possible that the budget tag we have preset may not be true for where you live. If that is the case, we suggest creating your own tag to apply to the recipes that meet your budgeting needs. You can then search the Recipe Box for recipes with that tag and schedule them right from the Recipe Box. 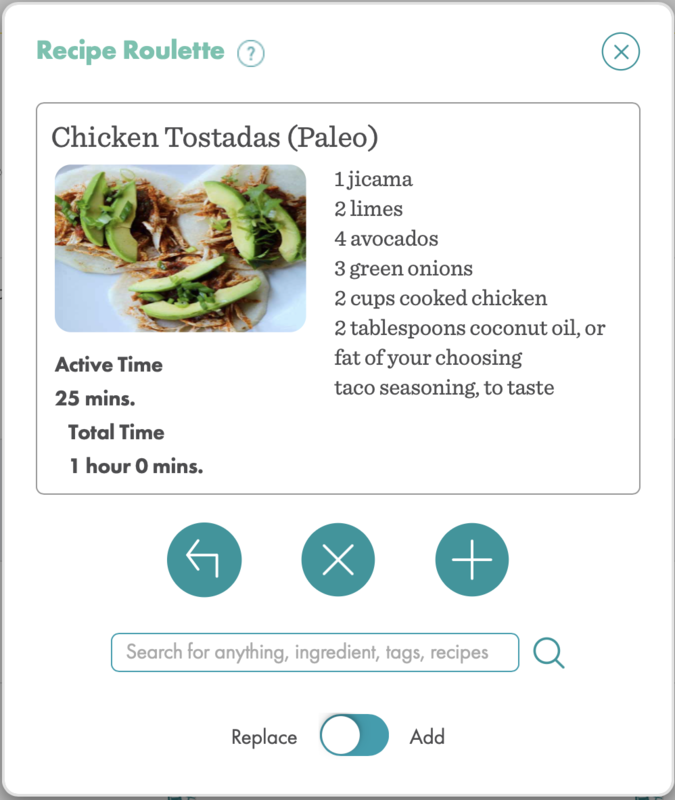 Recipe Roulette is a quick and fun way to add budget-friendly recipes to your Meal Planner. Open Recipe Roulette, type in your cost filter and any other criteria you may have, for example “$ chicken”. You will then get the most popular chicken recipes that are also the lowest identified cost first. You can also use this feature to search for recipes using ingredients you already have on-hand or items that came in your CSA box. You can use the Advanced Filters in Settings->My Meal Plan->My Schedule (Settings->Whole30 for our Whole30 subscribers) to schedule budget-friendly meals to be automatically generated in your Meal Planner by using a few tricks. We have a selection of budget-friendly recipes in the Recipe Box that are tagged “budget”. 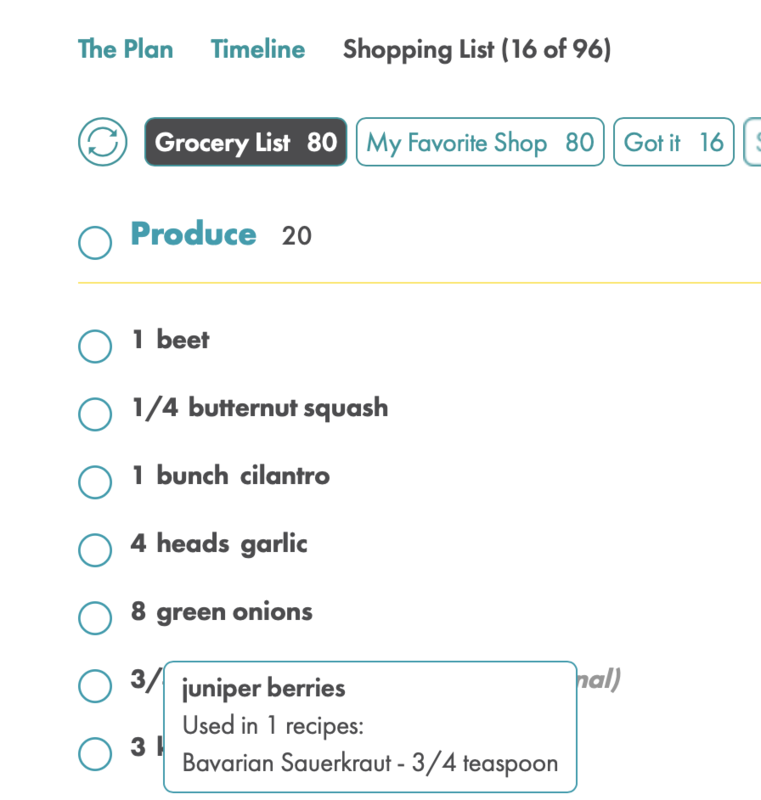 You can also apply the “budget” tag to other recipes in your Recipe Box or recipes you import that take fewer or less costly ingredients and then use the Advanced Filters to schedule meals with that tag. The “Simple” tag can help create a budget-conscious meal plan because these recipes have fewer ingredients and are less complicated to make. You can schedule soups and salads for lunches for lower-cost lunch options. Make sure to adjust the number of servings you have set for each meal to accurately reflect the number of people you cook for at that meal so you are not buying groceries for four people to eat lunch if you are only cooking lunch for one, for example. We would love for you to come chat with us so we can walk you through the process of setting up your schedule in this way. Another great way to lower your shopping costs is to plan for leftovers. If you plan for every single meal on every single day, there will be times that you are unable to cook those recipes, and that food will get wasted. Instead, plan to eat leftovers a few times a week. You can use the Advanced Filters to increase the number of servings for a meal, turn the next day’s lunch or dinner off in My Schedule, and add a note to schedule leftovers to appear in your Meal Planner every week on that day. Exclude expensive ingredients or use a substitution. Another handy way to help you stay within your budget is to exclude those ingredients that cost more or that you don’t feel are worth the cost. Things like lamb, for instance, can get pretty pricey, so excluding lamb will keep it from showing up in your Meal Planner or your Shopping List. Alternatively, you can simply substitute a less expensive type of meat. That way, you will still get the lamb recipes but will just use a different kind of meat. You may have to adjust your cooking times, so keep that in mind when making substitutions in recipes. Use your Shopping List as a guide. It is not set in stone. Your Shopping List will have each ingredient that you need for the recipes in your Meal Planner for the week. If you hover your cursor over an ingredient, you can see all the recipes that need that ingredient. This will help you determine if substitutions can be made. For example, if pine nuts are used to top a salad, you can substitute sunflower seeds to lower the cost. You can also determine if frozen vegetables could be used in a recipe instead of fresh to save on both cost and prep time (double win!). In this way, you can use your Shopping List as a guide to see what you need without feeling bound by its contents. If a different cut of meat is on sale, check to see if it would work for that recipe. If you received mustard greens in your CSA box, then there is no need to buy turnip greens. Knowing the recipes that will be using your ingredients is very helpful in determining if lower-cost substitutions can be made or if that ingredient could be left out entirely. If an expensive ingredient is only being used as a topping for one recipe, you can just omit that ingredient and mark it off your Shopping List. Shop for a few days at a time. You can save money by making sure the fresh produce and meats you are buying do not go bad before you get to the recipes for which they are being used. One way to do this is to choose a Custom Date Range in your Shopping List so you are only shopping for a few days at a time. You can do this by heading to your Shopping List and selecting Actions->Custom Date Range. Shopping for a few days at a time will also help divide the amount of money you are spending on groceries into smaller increments, so you won’t be shelling out a larger amount all at once. The Real Plans Blog is full of fantastic information to help you with your meal planning. We have a great article on our blog that tells you the best ways to keep your produce fresh and delicious. Using these ideas will help save you money by keeping your food fresh and ready to eat. There is even a printable list you can post on your refrigerator so everyone in your household can easily see the best way to store those delicious fruits and veggies! You can find it all in this blog post. You can also find more budgeting tips, as well as meal-planning tips in general, in this blog post about meal planning.